Firstly: It tastes absolutely scrumdiddlyumptious, and who can possibly deny a scrumdiddlyumptious dessert? The chocolate buckwheat crust in particular is my favourite. Oh good lord. The flavour is so dense, rich and chocolatey and the buckwheat gives the most satisfying little crunch. I love it almost more than life itself. Secondly: It contains pumpkin. AKA: A VEGETABLE! How many delicious desserts containing vegetables can you say you’ve eaten? No, no, actually- how many times in life have you eaten chocolate together with a vegetable? …Not many, I’m guessing. So the fact that this cheesecake actually contains a serving of vegetables and STILL tastes damn delicious is really quite telling of this cheesecakes boss credentials. Thirdly: This is so easy to make. Seriously. 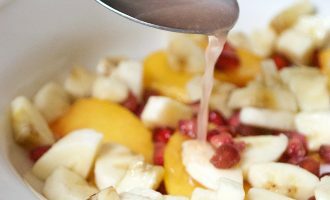 If you’ve never tried your hand at a vegan cheesecake before, then now really is the time to start. Yes, you. Right here. With this cheesecake. It takes less than 30 minutes to make, with no 500 step methods or fancy techniques required. Are you on board yet?? Fourth: Um, it’s almost HALLOWEEN! So of COURSE you need to make yourself a delicious pumpkin themed delight. You may have noticed that I’ve switched up my photography style in this post! I’ve been admiring the beautiful moody photography from bloggers such as Green Kitchen Stories, The Brick Kitchen and Rawberry Fields ever since I started food blogging, but for the longest time something seemed to be holding me back from branching out into the same style. Maybe I figured I just needed to practice getting good at the basic stuff first. Anyway, enough is enough! After a whole 8 months of food blogging, I’ve decided to take the plunge! Today’s blog post showcases my first attempt at moody photography. I figured, what better time to try it out than autumn/winter? I especially love how the dark, moody look compliments the halloween theme of this pumpkin cheesecake. What do you think? Do you like this style of photography? I’d love to hear your thoughts. And now for cheesecake! YES! 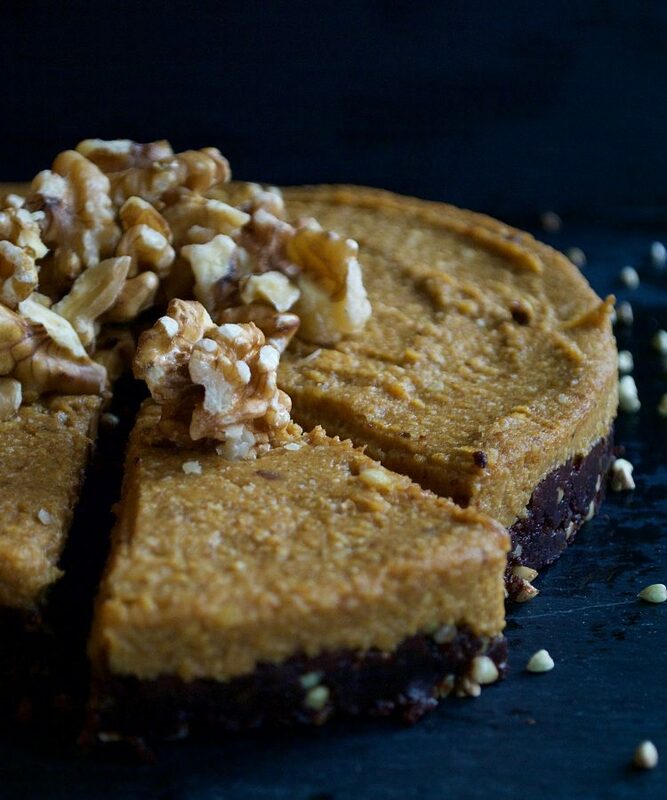 This pumpkin cheesecake with a chocolate buckwheat crust is the most delicious, fuss free dessert to share with your family and friends this autumn. First, grease a round baking tin with some coconut oil, and set aside. For the crust, blend the dates, walnuts and coconut oil in a food processor or nutribullet. Once blended, transfer the mixture to a bowl and add in 25g cocoa powder and 50g buckwheat groats. Using your hands, combine everything together. Press the crust ingredients firmly into the greased baking tin, aiming for as even a layer as possible. 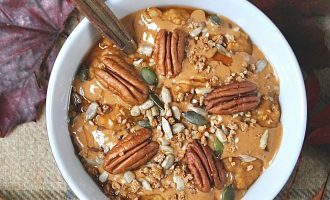 For the top layer, blend the dates, pumpkin puree, peanut butter, cashews, cinnamon and almond milk together. Pour the mixture over the crust, being sure to spread it across the tin evenly. Pop the tart in the fridge for 1-2 hours before serving. Arrange the crushed walnuts on top of the cheesecake for the final touch. This tart will keep in the fridge for up to one week.